For those who have Actually used it or are using it now, what is your opinion and take? For those running this how does the water pump handle the thicker viscosity of this coolant? My only "personal" experience is in my friend's RX7. He used it to fight the severe hot spots that rotary engines have, which can easily boil water-based coolants at higher power levels. Worked well, but he switched back to the regular stuff after a rebuild. Can't exactly remember why. Any particular reason you're considering it? I'm doing quite a bit of routine maintenance on the car and will be ripping the car apart. A good friend of mine mentioned this option so I started reading into it and while it does look promising I want to hear from first hand users of this product specifically on Honda motors and how it fared with this option especially how the pump handles the viscosity and long terms affects. If i don't get enough feedback I'll be sticking to the usual water wetter combo. I have been running it in my turbo B18 for about 2,000 miles with no problems. When I was building the motor I just wanted to have the best of everything and my research indicated that it was good stuff, so thats what I went with. It has never come close to overheating or anything, but I also have a Fluidyne radiator and a pretty bad *** fan. Not sure I can say its worth the money or not, but I'm sticking with it for now. **** is expensive though! I know a guy on the Geo Metro Forum that uses it with no issues. Been using it for quite awhile. I think it may be an EV car though, don't remember. No issues from what I've heard. thanks for the feedback, would love to hear about someone running this for a long time and their thoughts on it. The guys who answered and anyone who has been running this stuff for a while I would love to heard some feedback. Going to tear the motor down and thinking of using this. I'll be using it in my builds. The thing with waterless coolant is as it heats up it doesn't expand so there's no pressure in the cooling system, it runs at ambient pressure. So as the coolant heats up there's nothing to boil so there's no worries about localized heat spots, steam pockets, etc. 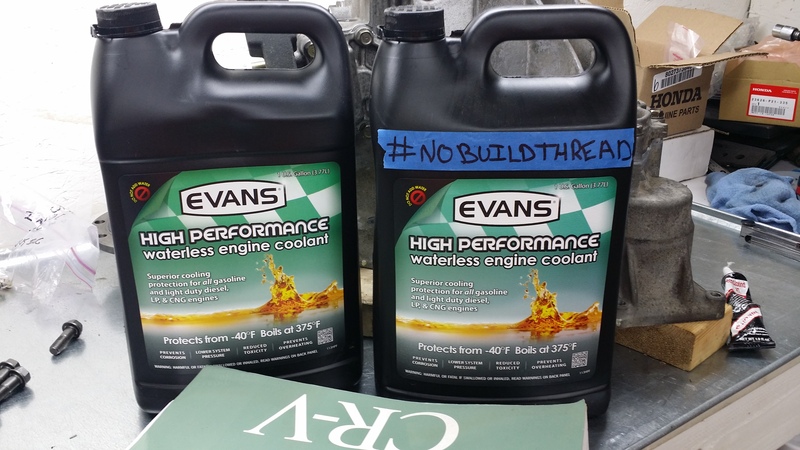 Because of the no pressure deal a system that used normal coolant requires some changes, however I can't find what is needed, Evans says to contact them. Although they do say you can safely run higher coolant temperatures safely which yields higher fuel economy. The other nice thing is because the coolant system is no longer pressurized there's no worries of air pockets and bleeding nightmares (you use a vacuum lift method to fill) and no more blown hoses or head gaskets. You'll want to use the racing version, not the standard stuff. Also it's lifetime coolant which never needs replacing so if you ever have to pull the engine again you just drain it all and keep it. I too am looking for more information. If you google it you'll see a lot of videos from Jay Lenos Garage but they just talk about the benefits and I didn't did anything on retrofitting and such. I'll see if I can dig up the guy I know running it. It has been awhile since this thread was posted. I'll have to go through some build threads and PM some people. I was considering using it because of extremely rusted sleeves, but due to my location I cant legally ship petroleum products, plus really expensive. I am currently planning to use OEM Audi premixed coolant, after I get the rust out of the block. Oh, you guys talking about this stuff? Me like. I feel the attitude of that painters tape jumping out! I was unable to find my guy from before. I just can't remember his screen name and making a thread searching for him seems like too much. Guys, I've decided against using this and I'll tell you my reasons. 1. It raises nominal temps b/c it does not transfer heat better than water, fact. 2. It is much more viscous than water and after some more research it appears they now recommend an external pump for some applications b/c of the stress this puts on the factory pump and given more work the pump has to do it drags your low end down a bit probably on our low comp 4 cylinder turbo setups like having an AC on all the time most likely, the concern here is stress on water pump. 3. If you run a dual core half size rad b/c you have forced induction like many of us do than this probably is not a good idea due to the fact the fluid will not move as fast as water being thicker to properly cool it down, the larger surface area of a rad is desired so unless you run a custom radiator which some of you might I wouldn't advise it. I've been looking for reasons for years to use this stuff and every time I do a rebuild, I visit this again, but I find myself looking at thread from other forums with guys having mixed results. There in lies the issue is the mixed results. Taking the motor apart b/c of a warped head or blown hg or other issues is not fun and not something I personally want to experiment with. The biggest issue I see is the nominal raised temps of about 10-45F depending on the application. Now as you can read from the results not too many with this who have used it for more than 50k or longer have chimed in yet to give us their results but it is a mixed bag on other forums. Still would like to hear feedback from those using this for a daily driver on a built NA or FI setup regardless. So I am just going to assume most of what you said came from this? They are good at wording things for sure, but they keep going back to straight water and water with their additive rather than a proper (depending on climate) 50/50 or even 70/30 mixture of antifreeze to water. Unfortunately this information is CONTINOUSLY regurgitated, but run it or don't, definitely no skin off my back. I read that and just kind went meh. If you setup a system properly Evans works. Plain and simple. I read that article as well as many other and Evans dispute to their claims, but a lot of what I said is fact based on people who have used the product, viscosity is obvious, water has better thermal transfer and a smaller radiator is not ideal. I take everything with a grain of salt unless I do it myself, with that said I only run distilled water and water wetter. No need to run antifreeze here in cali where I'm at. With that said I would still like to hear first hand from folks with honda motors and their results with boosted applications. I wish I had a way to test the viscosity for you, but I don't (no, I am not using tubes or a cup with a hole in it). A good jug shake is all I got...and you can BARELY tell a difference between 50/50 premix and the Evans. As far as running it, what kind of feedback are you looking for? That it works? It does. Like I said before, opinions are like ********, everyone has one. I don't think you are going to find the game changing review you are looking for as most people don't have the equipment to do the proper testing nor do most care to do such testing. What I find funny about that article above is that they talk about GMs like they don't already normally run 215° - 230° F on the norm. Take a look at a stock LT1, LT4, LS1, or whatever stock ROM, the fans are set to come on stupid high. They aren't looking at 4 bangers that consistently run 180° - 200° max from the factory. The only real issue I can see people having is proper change over full evacuation like the article explains. BUT, that comes down to user error and oh too often gets blamed on the manufacturer. If you live in an area where you can run straight water with additives or minimal coolant, then I HIGHLY suggest you do that. Why would you want to mess with antifreeze at all? For those of us who see temperatures that dip down into the -20° F range at times, well, we have a different take on what is and isn't worth it. I mean here in Georgia normally we don't get below freezing. However looking at the last few years of winter-pocalypse it starts to make one think. I'm really only looking towards Evans for the Civic and the two S13s as they will be very high specific output and see track abuse but all will run the largest radiators possible (I have a Nascar PWR for the V8 S13), electric water pumps, electrical pre-oilers, etc. For the SVT and the accord water and water wetter should do because they are sub 500hp street rats. If it looks like it's gonna get near or below freezing I can drain some out and replace it with ethylene glycol for freeze resistance. Granted I'm hoping to have a house with some sort of shop soon so they can all stay indoors. The main things I like about Evans are no coolant system pressure (again bye bye blown things) and the ability to run them a bit hotter than with water/ethylene glycol based coolant which should help nudge a bit more fuel economy out of each. Even though I'm not really concerned with fuel economy that much but it would be nice to not have to fill up THAT often lol. And yes GM cars seem to like to run hot. Our 2015 Escalde can run as high as 225-230 pulling the Z06 up a steep grade. The Z06 is a time attack car now so it has a whole slew of cooling upgrades for it to run at "normal" coolant temps. The facts are there, there is no ambiguity in that. You can't change the properties of the fluid, it is much more viscous than water, not sure what 50/50 mix you are using but I've yet to see aa 50/50 mix as thick as Evans and yes I have a bottle of it. With regard to the information I'm looking for, simple, who is running this on B series FI motor? How long have you ran it? What kind of temps have you logged? Across different forums you will get folks who like myself datalog and actually look at the data after to determine deltas and analyze improvements. The folks running this in their setup confirmed the facts we know of this waterless coolant, temps spike compared to water at nominal conditions and get worse at idle, less air flowing through smaller rad is not ideal for this system in hot ambient conditions. Will this works in 70-80F weather conditions, sure so will water/coolant etc, I'm more interested in how this performs in hot days more than anything. There are trade offs for sure but from what I have gathered it is not worth running this due to those constraints. Needless to say, I have yet to read about anyone running this in a FI application for extended period of time. Worth using OEM oil filter on an RSX?